In the fall of 2018, the University of Texas Press will publish the inaugural volume of the Texas Bookshelf, a major new history of Texas by Stephen Harrigan, the New York Times best-selling author. The Texas Bookshelf promises to be the most ambitious and comprehensive publishing endeavor about the culture and history of one state ever undertaken. Comprised of in-depth general-interest histories of a range of Texas subjects--politics, music, film, business, architecture, and sports, among many others--the Bookshelf volumes will be written by the state's brightest authors, scholars, and intellectuals, all affiliated with the University of Texas at Austin. Published in a signed edition, They Came from the Sky offers an exciting preview of Harrigan's sweeping, full-length history. This tantalizing "short" begins with the earliest native inhabitants over ten thousand years ago and continues through the ill-fated Spanish explorations of the sixteenth and early seventeenth centuries. In its pages, we encounter the prehistoric flint producers and traders who were Texas's first entrepreneurs; Spanish castaways and would-be conquerors; the Karankawas, Querechos (Apaches), and Caddos, whose lifeways were forever changed by contact with Europeans; and the "Lady in Blue," an abbess who mysteriously claimed to have visited the "Quivira and the Jumanas" in Texas while remaining within her Spanish cloister. 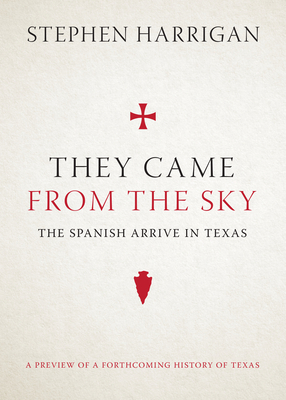 Bringing Stephen Harrigan's formidable narrative talent to the founding story of Texas, They Came from the Sky constitutes the vanguard of a major publishing event.